We got an entire Hotel reserved for Vienna EUDC 2015. It’s across the street from the campus. 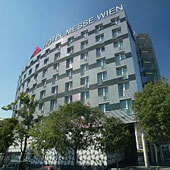 Most participants at Vienna EUDC will be accommodated in the Austria Trend Hotel Wien Messe, which is right next to the WU Campus. The hotel has space for over 500 participants in air-conditioned two-bed rooms. Look forward to enjoying your room with the view on the Prater there, have breakfast at the hotel, step out and end up right at the announcement room. Since Vienna EUDC 2015 is expected to exceed 500 participants, we are currently negotiating with the Courtyard by Mariott Wien Messe and the Motel One Wien Prater. Both of them are also right next to the campus and have a very similar standard to the Austria Trend.